Ships today if you order in the next 3 hours 23 minutes. Auto Ship & Earn + 129 Points What's this? 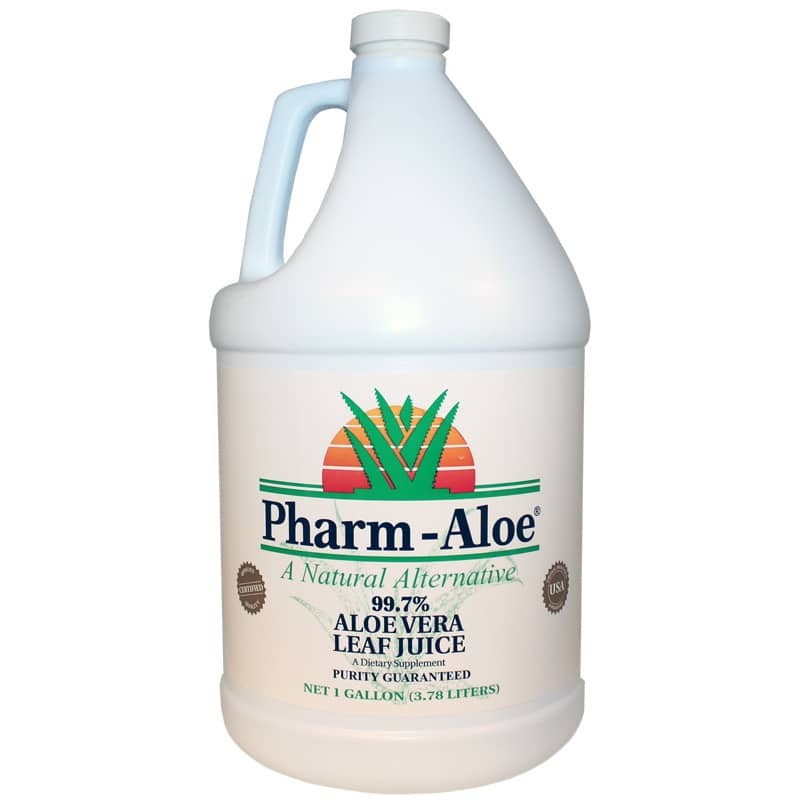 Pharm-Aloe 99.7% Organic Aloe Vera Leaf Juice is a high potency aloe vera supplement that provides support for digestion, maintaining good health, youthfulness, high energy levels, and the immune system. Contains maximum polysaccharides (5,000 GÇô 9,000 mgs/L MPS). Pharm-Aloe Aloe Vera Leaf Juice has 3 to 6 times more potency than Aloe Vera inner leaf juice. This is due to the fact that the greatest concentration of active ingredients is where the rind of the aloe Vera leaf interfaces with the inner gel of the leaf. If, in processing, only the inner gel is removed from the leaf and the rind discarded, you lose 300-600% of the active ingredients. Pharm-Aloe utilizes the entire leaf by grinding the leaves into a puree and then by filtration removing the rind, anthraquinones and aloin leaving a decolorized, clear juice that has 3 to 6 times more potency. Independent (Third Party) Laboratory Tests guarantee the highest potency and purity of Pharm-Aloe 99.7% aloe Vera Leaf Juice. MPS (Methanol Precipitable Solids) are used for determining the potency of an Aloe Vera product. 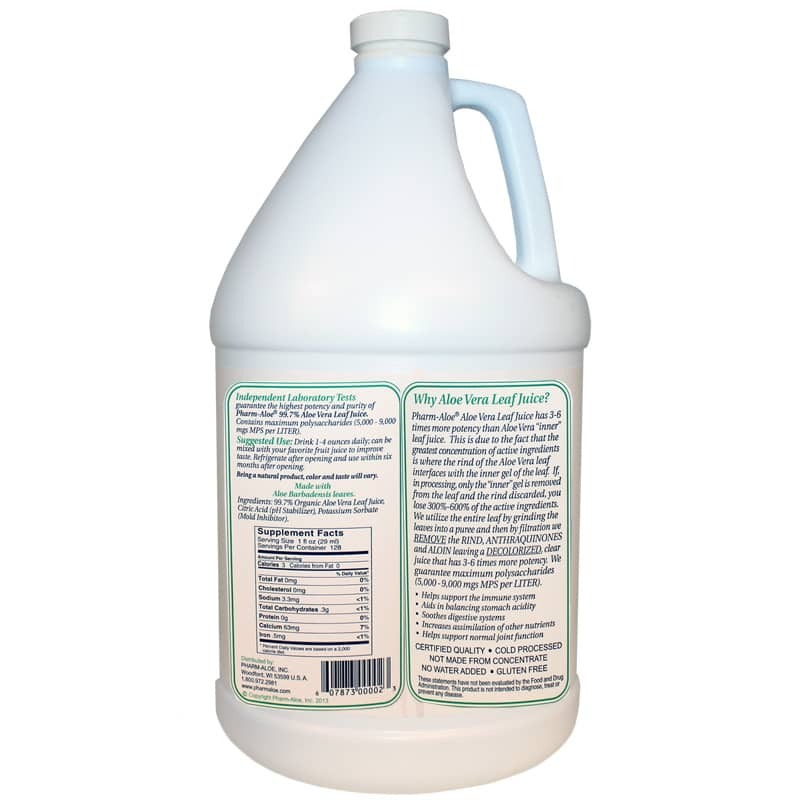 A pure Aloe Vera Leaf Juice should have a MPS Value of 5,000 - 9,000 mg/L. Approximately 50% of the MPS value are polysaccharides which are considered to be one of the most important active ingredients in Aloe Vera. Ingredients: 99.7% Organic Aloe Vera Leaf Juice, Citric Acid (pH Stabilizer), Potassium Sorbate (Mold Inhibitor). Adults: Drink 1 to 4 ounces daily; can be mixed with your favorite fruit juice to improve taste. Refrigerate after opening and use within six months after opening. This product has been very successful for us. I've been taking Aloe Farms juice for some time. They no longer carry this brand; so, It was recommended that I try Pharm Aloe, instead. I found it to not require a sweetener of any kind and I take it every day. A great product from a great company. I have been using Aloe Vera Leaf Juice for over one year now & am very pleased with the results. Delivery is unbelievably fast & customer service is always available & helpful. As I said in my review title, a great product from a great company. Natural Healthy Concepts provides a great product at a great price and backs it up with fast shipment awesome customer service. A great source for Aloe Vera Leaf Juice and other natural supplements. I am a very happy customer. A pure, potent product from a great company "Naturally Healthy Concepts" <br>Thank you. This is a high quality product that works...best fighter of inflammation out there. I use it everyday and have used it for several years which has greatly improved my health!!! I enjoy drinking my Aloe - I will purchase another bottle once I am done.